Colin Buckingham with his 19lb 5oz carp. Hotpoint AC fished the famous Beastie Pool at Decoy on Sunday and it certainly lived up to its reputation of producing some very big fish. Pete Sanderson topped the field from peg three, catching on a small feeder all day with red maggot and weighing in 59lb 9oz. All the talk, however, was about runner-up Colin Buckingham’s huge carp taken in the dying minutes of the match from peg 14. At the scales it weighed in at a huge 19lb 5oz and together with barbel he had a total of 53lb 5oz. That fish demoted me to third with 49lb 12oz, taken on caster and soft pellet on the pole on peg 11. Cedar Pool on the Decoy Lakes complex was the venue for the latest Fenland Rods match and a cold northerly wind leading up to the day saw weights much lower than of late. Mac Campbell led the way with a 60lb 6oz net of carp taken close in on red maggot. Runner-up with 59lb 8oz was Neil Garner, whose swim came alive in the second half of the match. 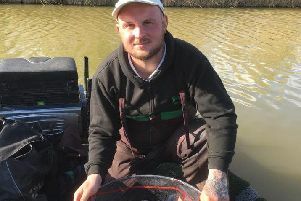 Third was Mel Lutkin on 40lb 2oz with Joe Bedford finishing close behind in fourth with 36lb 9oz.